Servers for Software Defined Storage: Servers designed for deployment as storage nodes in a software defined storage cluster. Servers for software defined storage nodes are characterized by their enclosures which house dozens of HDDs or SSDs. 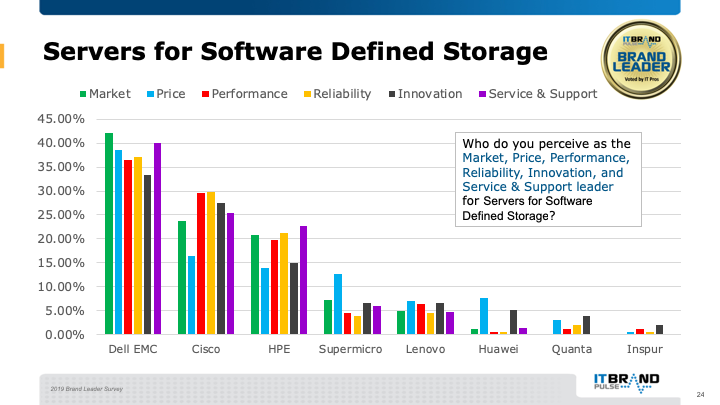 Dell EMC headed up all six leader categories in the Servers for Software Defined Storage survey for the second year in a row: Market, Price, Performance, Reliability, Innovation, and Service & Support. Cisco was named second for Market leader followed by HPE.